Review: "Pilates with Ring and Foam Roller Audio"
This audio,”Pilates with Ring and Foam Roller Audio”, begins gently with the Magic Circle. 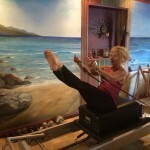 Lynda has you move from an easy and gentle waking up of the hips, inner & outer thighs, to some shoulder girdle mobilization and bicep/tricep things that really get into the smaller muscle groups often overlooked by larger movements done with weight. She throws in enough glute work (I felt em) that is somehow easy, yet sneakily muscle-sculpting intense all at the same time. Her cues are easy to understand eliminating the possibility of not getting it right…The 2nd part of the audio is done with a foam roller. Immediate wake up call stretch, strength and delicious massage for the back, sides, hips and legs, it’s that ‘hurt so good’ feel. I liked it and would recommend this audio for when time is an issue and you have to hit all the important parts, or when traveling, because of the minimal equipment and space required. It is suitable for pretty much any level of exerciser, because you will gain balance, strength, and control, and you can challenge yourself with the moves to make it even more challenging. I used a very firm foam roller, so I didn’t have a cushion or sink into it at all, making the balance parts fairly tough. Lynda has this really great way of not letting you know that it’s going to be hard, and then it just is! 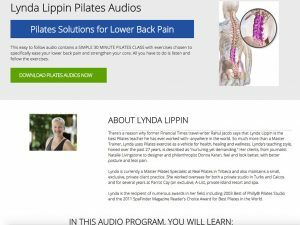 Here is the link to Lynda Lippin Pilates Shop where you can buy the audio’s and the e-course.